If you’ve tried to buy running shoes lately, you may have felt a bit overwhelmed. Given the countless options on the market these days, it can be difficult to choose. 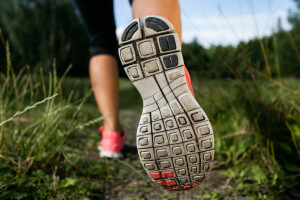 When it comes to running, function is the most important factor for shoes, and your shoe choice could significantly affect not only your comfort, but also the health of your feet and legs. Here’s how to choose the right running shoes for your foot type. Take a look at the wear pattern on the shoes you use for walking or running. If most of the wear is on the inside of the foot, you probably have flat or low-arch feet, meaning that your feet roll inward as you run. This is called overpronation and it results in the foot and ankle being unable to properly stabilize the body. Another indicator of flat feet is the absence of an arch or inward curve along the inside of the foot. To select a good running shoe for flat feet, look for shoes with a straight shape that will maintain your stability and reinforce the arch. In cases of severe overpronation, motion control shoes may be the best choice, as they offer the most support. A high arch is pretty easy to determine, as you will see a sharp curve from your big toe to your heel. High-arched feet cause wear on the outside of the shoe. If you have high arches, you likely underpronate, or supinate, meaning that your feet roll outward as you run. Because the outside of your foot takes most of the shock in this case, select a running shoe with a curved shape that is flexible and cushioned, with a soft midsole to absorb the shock. Running can cause your arches to gradually fall, affecting the length of your feet, so if you have high arches, make sure to re-measure your feet every time you buy running shoes. If the wear on your walking or running shoes is fairly uniform across the forefoot, you likely have a normal or neutral arch. Your foot will have a noticeable inward curve along the inside, but it is no more than three-quarters of an inch or so. Most people have this type of foot, and semi-curved stability running shoes are generally the right choice for you. Avoid shoes that have too much rigidity or motion control, as those are designed to correct issues with other types of feet and can cause problems for normal or neutral-arched feet. Having your feet professionally evaluated can be beneficial if you are serious about running and want to take the best care of your feet. We can diagnose and help you understand any specific problems or conditions related to your feet. Contact the Steward Health Care: Centers of Orthopedic and Sports Medicine today to learn more about how running shoes affect your body. This entry was posted in Sports Medicine, Foot & Ankle, News on October 30, 2015 by admin.